Every river trip should have at least one safety line that is stored in the rescue kit. We recommend a rope that is 200ft long. 200ft will be eaten up by a Z-drag quickly so dont go short. 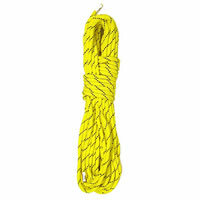 Blue Water River Rescue Rope is specially designed for river use and features low stretch, bright yellow color for visibility, kernmantle construction, and it floats. It also works great as bow and perimeter lines.